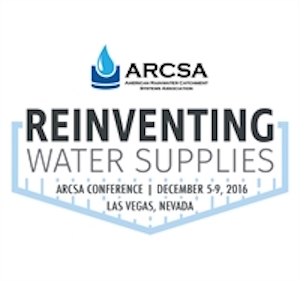 The theme of ARCSA’s 12th annual conference, set for December in Las Vegas, NV, will highlight reinventing water supplies. The Mission of the American Rainwater Catchment Systems Association is to promote sustainable rainwater harvesting practices to help solve potable, non-potable, stormwater and energy challenges throughout the world. The conference and expo will be filled with learning and buying opportunities and will be held at the convention center in conjunction with conferences for the Irrigation and Groundwater Associations. Visit the ARCSA conference registration page for more information. RainBank’s leader, Ken Blair, is an accredited ARCSA Professional, Inspector Specialist, Designer / Installer and Life Member, a Pacific Coastal Regional ARCSA representative and advisor to its education committee. 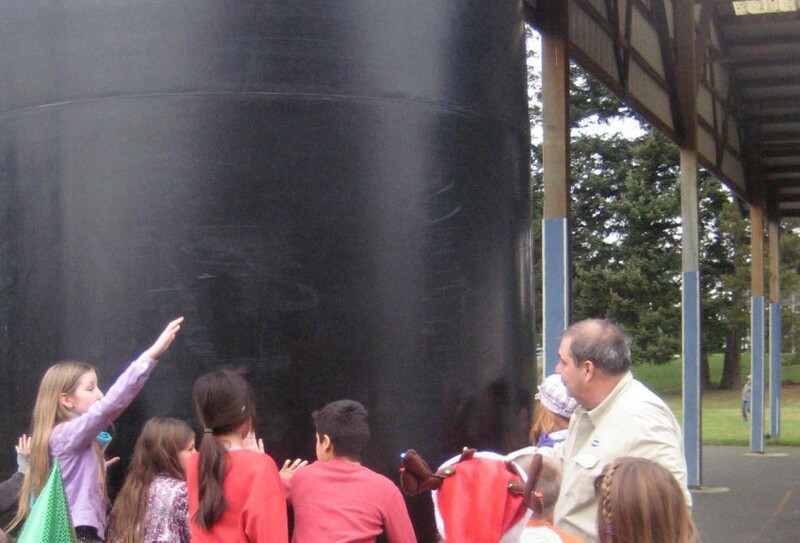 Ken is tapped by architects, engineers, government agencies and related professional associations to provide lectures or participate on expert panels to discuss Rainwater Collection Systems design and builds. RainBank is also the Northwest region distributor for Contain Water Tanks, which are backed with an unmatched 20-year warranty. With a little bit of creative thought, Tacoma, WA set out on a path of green capability while reclaiming a downtown area that had become degraded and mostly abandoned – partly using a Turkish bath. In an article from Environmental Protection Online, we learn how the city of Tacoma repurposed Park Plaza South. During the reconstruction, an old Turkish Bath was uncovered. Cleverly, the designers decided to use the old bath as a rainwater collection cistern, which would collect water to be used for irrigation and toilet flushing. “Other sustainable features at Pacific Plaza include 36 percent of the building materials being recycled, from structural steel and panel metal sidings to wood and windows. All of the products used met LEED (Leadership in Energy and Environmental Design) thresholds for low-emitting materials, while interior materials such as carpet, flooring, paint, and composite woods had low levels of volatile organic compounds. 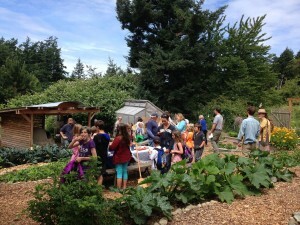 RainBank Rainwater Systems is very pleased to learn that the Farm to Cafeteria program is flourishing at Orcas Island School, thanks, in part to the Orcas Island Education Foundation. 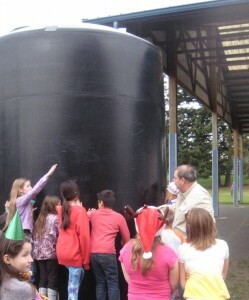 RainBank was asked to construct a system and then teach the children about rainwater collection and water conservation. The water is collected from the school’s roof and stored in a 5,000-gallon cistern to be used for irrigation of a vegetable garden. The vegetables are used as part of the school lunch program and to teach the students about sustainability. “Farm to school empowers children and their families to make informed food choices while strengthening the local economy and contributing to vibrant communities. NFSN provides vision, leadership and support at the state, regional and national levels to connect and expand the farm to school movement, which has grown from a handful of schools in the late 1990s to approximately 40,000 schools in all 50 states as of 2012. Click to learn more about farm to school nationwide. 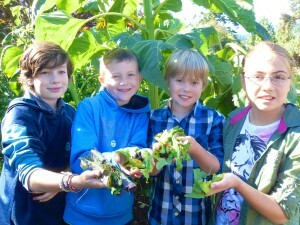 The Orcas Island School garden is flourishing and community involvement is extraordinary. 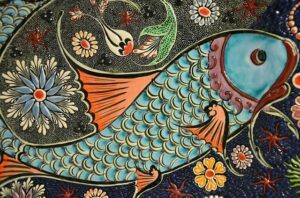 We are proud to part of this exceptional project and hope other communities will offer similar programs. Sustainability is the future for these young persons. We all benefit when our children have the opportunity to learn about, but also have access to healthy, local foods.